I was recently asked by the Alcuin Society if I would like to be one of three book artists representing the Society at the THE ART of BOOKS & PRINTING exhibition at the West Vancouver Memorial Library. What could I say but yes? I will have four or five works up in the exhibition, which will also feature letterpress publishers, book artists and illustrators, and binders. The opening reception is on Friday December 1 from 6:30 - 8:00 p.m., at 1950 Marine Drive, West Vancouver. Please come and join us! The Christmas Exhibition is now up at the Daily Grind Cafe at 1500 West Georgia. The group show includes works by Gary Sim, John Steil, and Andrea Taylor. All works are for sale. The cafe / gallery is open Mondays to Fridays from 7 in the morning until 4 in the afternoon. Images below are, left to right, by Andrea Taylor (2), John Steil (4), Gary Sim (1) and Andrea Taylor (2). Although the Transient Moorage - Summer Sketches only had 9 drawings in it, I have continued the series and completed 13 drawings to date. To record this series, I colour copied all drawings, wrote a brief description of each, and compiled them into a limited edition pamphlet. Somewhat to my surprise, I was asked if I would like to take over the position of Chair of the Architectural Institute of B.C. Gallery Advisory Committee. Although leery of dedicating additional time to volunteer activities, I decided that this position would be interesting and worth the effort. After saying yes, I also quickly found out that being Chair of this Committee also automatically placed me on the Communications Board, for an additional four meetings a year. Well, we'll see where this goes. Thank you to the folks who supported my appointment. An exhibition of new artwork by Gary Sim will be on display - and for sale - at the Daily Grind Cafe, 1500 West Georgia Street, Vancouver, from September 21st to November 2nd, 2006. Cafe hours are 7:00 a.m. to 4:00 p.m. from Monday to Friday. 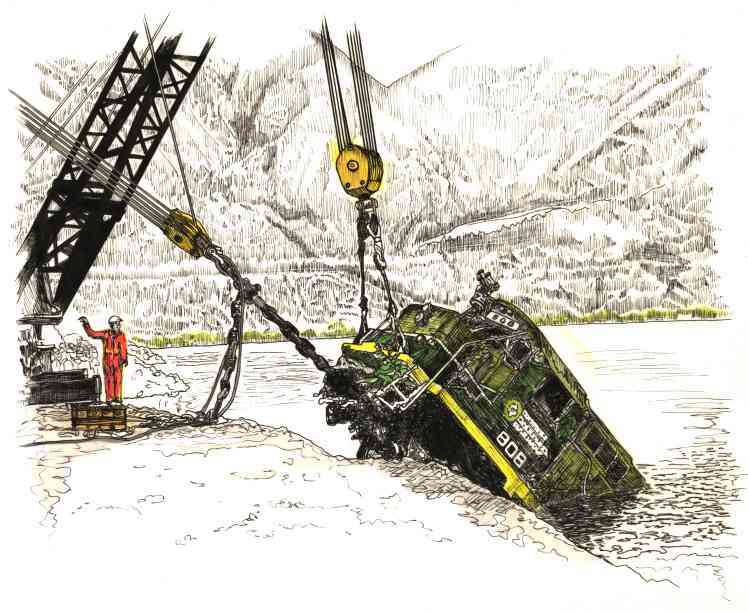 This solo exhibition has three groups of drawings - scenes from around Vancouver, scenes taken from photographs of railway salvage jobs, and one drawing/poem. The drawings are all original works of art, created this year. These works are drawn in pigment pen and ink on one side of a vellum sheet, and coloured on the other side of the sheet with india ink brush pens and prismacolour pencils. This allows linework and colouring to be worked on separately without one affecting the other, and the surface of the vellum allows the drawings to be scraped off as desired on both surfaces, either for shading and texture, or to remove "errata". 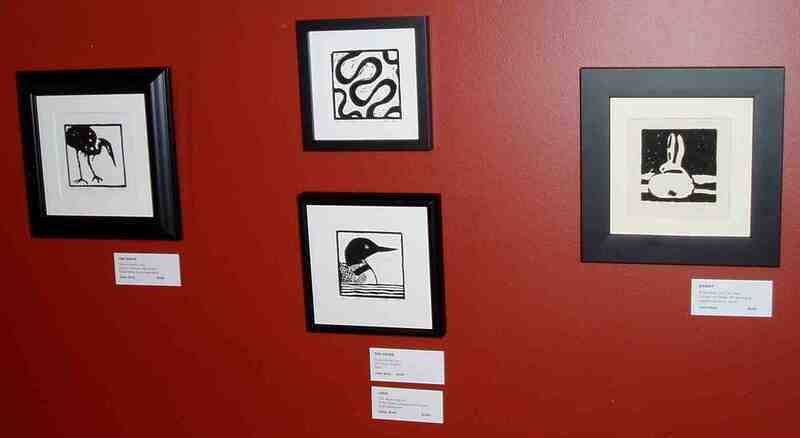 The two limited edition block prints by Sim in the exhibition, Higher Rises and Bridge, have been "nabbed" by Malaspina Printmakers and put up in the Summer Exhibition at their gallery on Granville Island. The exhibition closes September 8th or so. I suggested at an Architectural Institute Gallery Advisory Committee meeting that an exhibition of architecturally related works by members of Malaspina Printmakers might be a good idea. The committee liked the idea, and so did the printmaker's society. Members of the AIBC committee visited Malaspina Printmakers to meet them and view artwork, and were very pleased with the work available for exhibition. The show opens Thursday June 29, at the AIBC Gallery at 100 - 440 Cambie Street (facing Victory Square). The opening reception is from 5:30 to 7:30, with refreshments and hors d'oeuvres served. The exhibition runs to the end of July, gallery hours are 9 - 5 Monday to Thursday, and 9 - 1 on Fridays during the summer. Two limited edition block prints by Sim will be included in the exhibition, Higher Rises and Bridge. 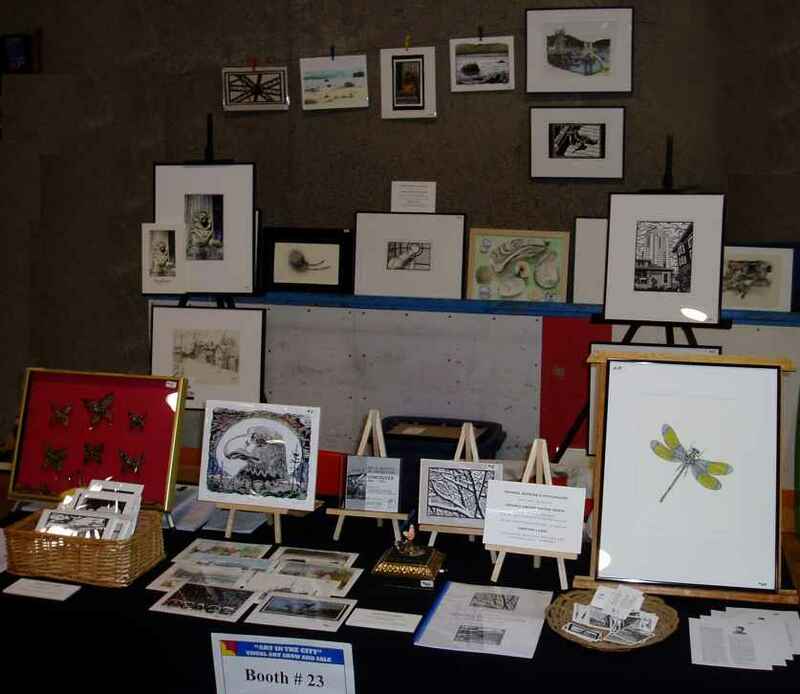 Artwork in the exhibition will be available for purchase through Malaspina Printmakers Society on Granville Island. Issue 142 of Amphora has been published. Another Sim article is included in the issue: "Collecting versus Entropy". The article is five pages long, with some thoughts about collecting, and some examples of things that are either kept or thrown out, with specific references to reading material and artwork. The day prior to receiving the journal in the mail, I was asked by the Alcuin Society if I would like to be nominated as a Director of the Society. For the second year in a row I had to decline the honour (and its attendant duties). I happened to notice the new reader board on Denman Street at the West End Community Centre advertising the first annual Art in the City fair in May. I went in and asked about it, booked a booth, and spent quite a bit of time preparing for the booth. Each artist got a ten foot by ten foot booth, plus a table and two chairs. The photo shows how I arranged my booth, although I moved things around during the three days of the show. It was an interesting weekend, talking to people about my art, and looking at other artists' work as well. The latest issue of architectureBC has been published with another Sim article included. It is the first one written under a nom-de-plume, in this case Uno. M. Ploid, E.I. The article is a tongue-in-cheek look at the current hiring situation in the architectural profession. The 40th Anniversary issue of Amphora has been published, Volume 140/141 of the journal. This issue includes the lengthy eight page commissioned article by Sim on the 40 years of Amphora history. The article was quite fun to write, as I had to read or review all of the earlier issues of the journal, thus steeping myself in the glorious pageant of letterpress and design work over the years. Congratulations are due to the Alcuin Society for forty years of publishing worthy volumes, for sponsoring many events such as the Antiquarian Books Roadshow and the Wayzgoose, for the many lectures and workshops they have put on, and for the continuing success of the Alcuin Award for Canadian book design. There has been an immense amount of volunteer work put into this lengthy list of accomplishments. Job well done! Best wishes for another successful forty years! One more article by Sim is scheduled for publication in the next issue of Amphora. A favorable review of the "flagship" Sim Publishing project Art & Artists in Exhibition: Vancouver 1890 - 1950 has been published in B.C. History, Journal of the British Columbia Historical Federation, Vol. 38 No. 4, page 26. Written by Cheryl Siegel, Librarian at the Vancouver Art Gallery, the review notes that the project will be "of great value to a busy librarian", that "the sheer volume of information is astonishing", and that it is "well documented and (with) most sources near at hand". She also notes one reference omitted, one file-in-progress that is incomplete, and a bit of technical difficulty accessing the CD on her Mac. A more general comment about the tendency of independant works such as this being too personal and lacking "a certain scholarly rigour" is duly noted and appreciated. Ms. Siegel and her co-librarian Lynn Brockington have been steadfast in their support of my work on this project. They and the Vancouver Art Gallery are due a significant and permanent "thank-you" for the time and resources they have made available to my research over the past 6 or 8 years. Without them the work would have been far more difficult. Thank you. The 139th issue of Amphora has been published. Another Sim article - on the making of the cover image for Amphora issue 135 - is published in the issue. The article is illustrated with a photograph of various types of images used in the creation of the cover image, which is a view of one of the lions on the Lions Gate Bridge. Just when I thought I was free of publishing deadlines (other than self-imposed), I received a call from the Architectural Institute of B.C., wondering if I'd like to write a "tongue-in-cheek" article about looking for work in the current architectural job marketplace. I said yes, and the resulting article will be published in the next issue of architectureBC, under the aegis of my first nom-de-plume. An exhibition of new artwork by Gary Sim will be on display - and for sale - at the Daily Grind Cafe, 1500 West Georgia Street, Vancouver, from January 20th to June 21, 2006. Works purchased can be taken immediately and will be replaced with more new work. The scenes are taken from Sim's travels around British Columbia, including Savary Island, Lund, Seton Lake, the Queen Charlotte Islands & Vancouver. The drawings are original works of art, created since January 1, 2006. These works are drawn in pigment pen and ink on one side of translucent paper, and then given a colour wash on the other side of the sheet with india ink brush pens. The resulting images are best seen when the drawings are matted on bright white paper, at which time the colours and the blank areas of the drawings are highlighted from behind almost like stained glass. Cafe hours are 7:00 a.m. to 4:00 p.m. from Monday to Friday. BUNDLE IT UP! 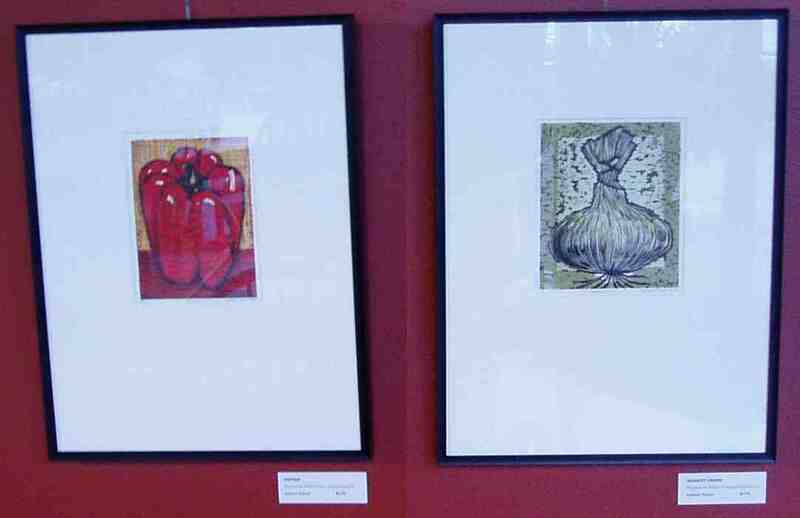 - the Winter Show 2005 of the Malaspina Printmakers Society - closes Sunday, January 22, 2006. Prints by Gary Sim will continue to be available from the Society at their gallery, shrinkwrapped and in either the print racks or in my artist file. Don't hesitate to ask gallery staff for help! 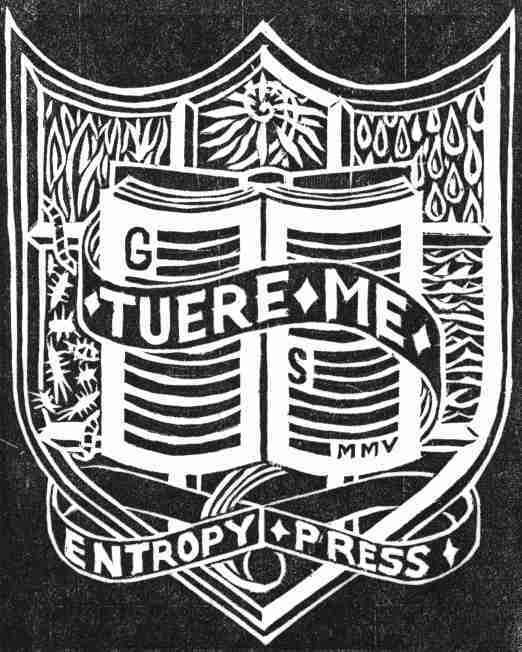 The wood engraving commission for the "printer's mark" project was accepted subject to minor block sanding, and is now in the hands of the Alcuin Society. The image above shows a test proof of the block prior to final detailing and sanding. A book is shown above a shield containing "charges of adversity" such as rain, floods, fire, and insects. The entreatment "Tuere Me" translates from Latin as "Take Care of Me". It is intended that this engraving will be printed in an edition of 500 by Barbarian Press. 375 will be "tipped in" to a future issue of Amphora. The remaining 125 are intended to be compiled into a chapbook containing a total of 12 original bookmark prints, with the remaining prints being created by 11 other artists including noted Canadian engravers Jim Westergard, Shinsuke Minegishi, and Wesley Bates. The final article in The Digital Drawing series has been published in the Winter 2006 issue of architectureBC. No further articles for this journal are currently in the works. This project continues to expand with the addition of more information to the CD-R. Release 1.21 is about to be issued to registered owners who have not previously received an update. For some owners this will be a significant upgrade to the amount of information they have. A review of the project has been written by Cheryl Siegel at the Vancouver Art Gallery, and submitted to the B.C. Heritage journal for publication. It is not known at this time when or if the article will be published. Well, the year ended differently than I would have expected. After 14 months of working for Parallel.AT Services, I gave notice and quit in mid-October. This began a great long vacation for me, although my idea of a vacation is to write, research, draw, paint, photograph, and carry on numerous projects. A number of complicated block prints have been issued since October, with two new ones nearing completion. 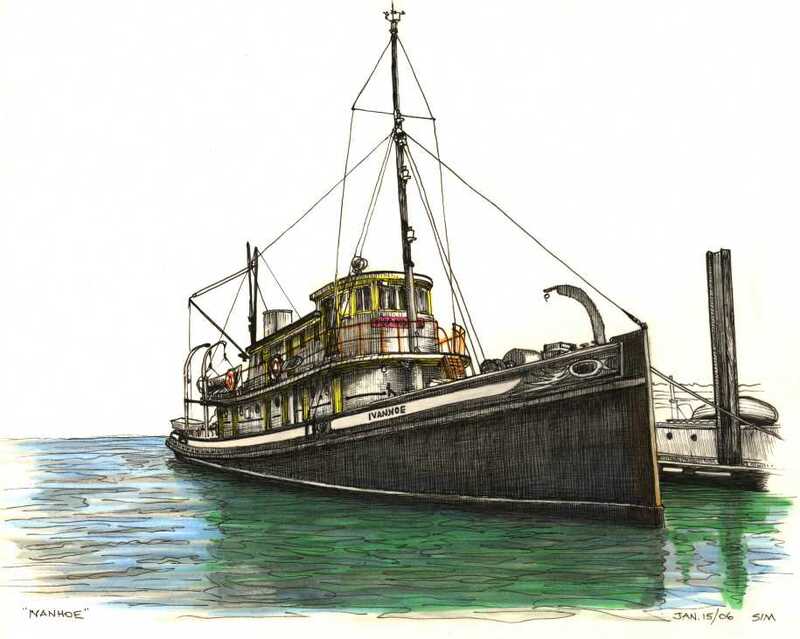 Numerous pen & ink drawings and sketches have been created, as well as pencil sketches. Much writing and research has been done, with a number of new projects in the works, including my first artist's book Westerlies, publication is pending completion of some linocuts for it. Published articles in 2005 included the Digital Drawing series for architectureBC, and a series of unrelated articles for Amphora. My art is being shown in more galleries now, but this still needs to be expanded to include at least one gallery that will represent all of my artwork all the time.